It is not surprising why Volusion is one of the most popular solutions around. The solution is so simple to use and it’s loaded with useful features which makes it good value for money. Sure, it’s not perfect. But no solution is. There were a couple of glitches during my few days journey with it but nothing major. This solution would fit the needs of small/medium sized business nicely. O, Yeah! Easy-to-use interface, useful dashboard, useful features like Deal Of The Day, decent looking free templates, paid templates are reasonably priced, Fraud Score. O, No! Some of the features and tools doesn’t always work the way they should. High overage charges, SSL cert charges, SSL installation charges, monthly PCI fee charges. 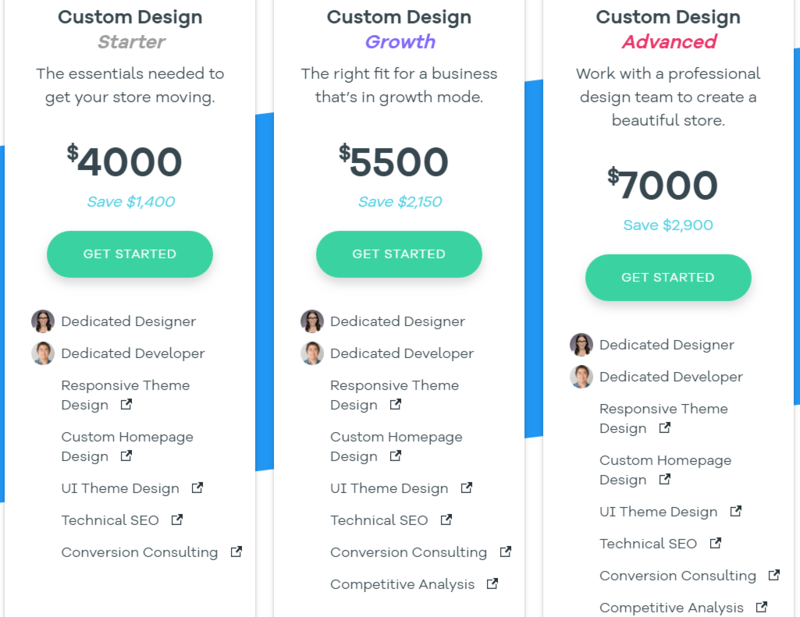 Volusion used to offer 5 different pricing plans but have since streamlined it to 4 different pricing plans which ranges from $15 – $135 per month to suit different budgets. Merchants who wish to pay annually will get to enjoy more savings which is a good incentive for them. However, it’s good to see what is being offered on each plan as Volusion does not offer all their features on every plan. Some I would agree on as you certainly don’t need to import/export if you have less than 100 products since you can set up your store manually. If you have more than 100 products, you’ll need the import/export feature. Feature wise, you get everything the solution has to offer from the Pro Plan onwards @ $75/month. 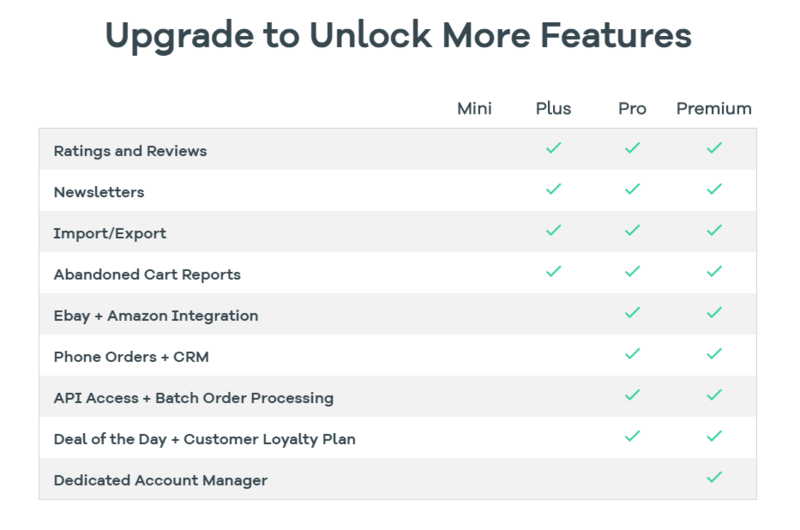 Suggestion : Features like Abandoned Cart Reports, Ratings & Reviews, eBay integration, Amazon integration, Newsletters and Deal of the Day would benefit the Mini Plan folks since they are starting out. Being able to promote one’s product in marketplaces like eBay and Amazon would help give them more product exposure. Volusion charges PCI fee of $1.83/month (for the Mini and Plus Plan) and $3.74/month (Pro and Premium Plan). The PCI fee is in addition to the monthly subscription fee. This fee is to help Volusion offset the huge amount they are spending monthly to ensure they can maintain their high security standards. 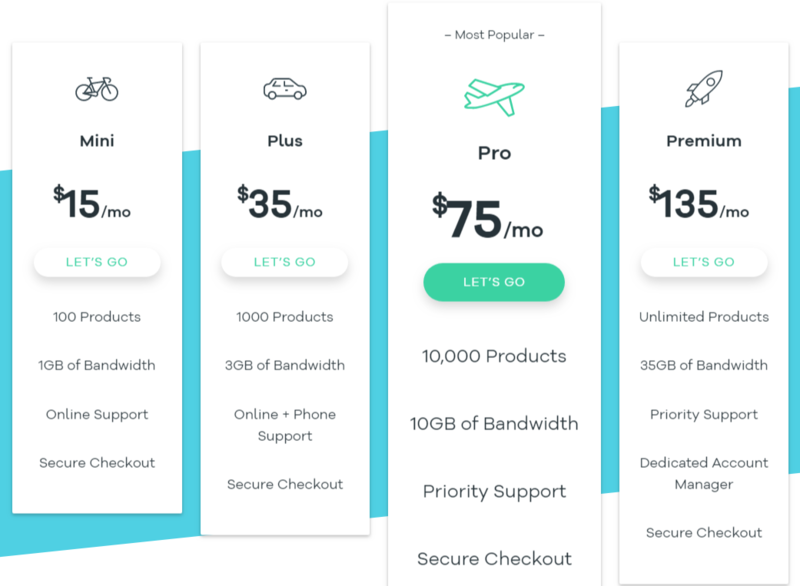 Watch Out – Bandwidth : Volusion charges $7/1GB/month for additional bandwidth. Please keep an eye out on your bandwidth usage or you’ll have to pay the additional bandwidth charges monthly. 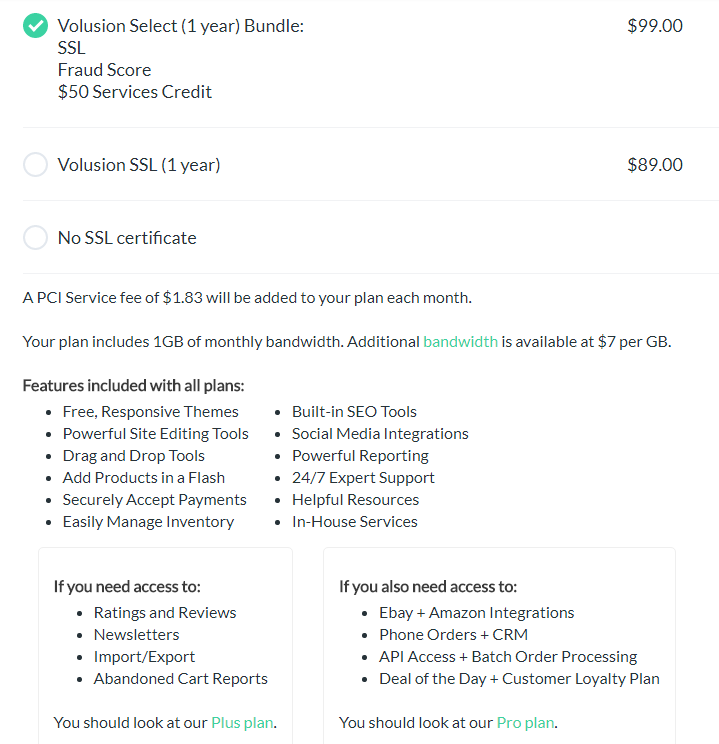 Merchants who wish to use Volusion will notice they offer their Volusion SSL (1 year) at $89 OR merchants can pick the SSL + Fraud Score + $50 Service Credit for $99. 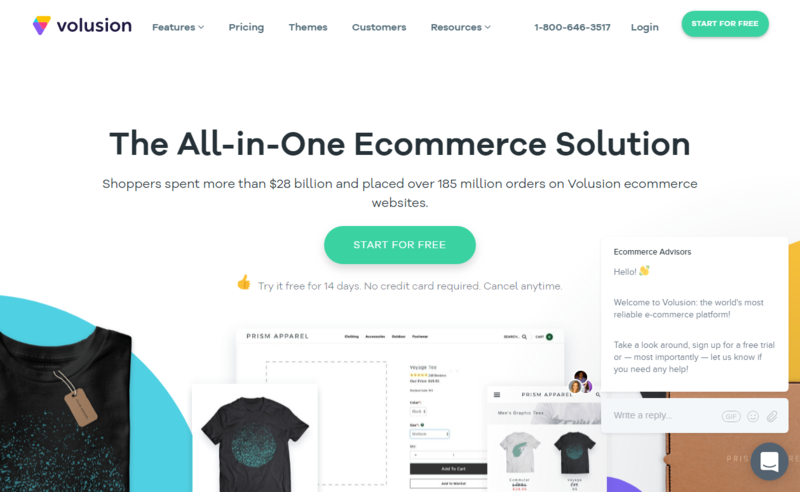 Since all ecommerce websites must have an SSL certificate to ensure safe credit card transactions through their sites, merchants have the option to buy the SSL certificate from Volusion and have it installed on their site for free OR they could buy their own SSL from other third party SSL. 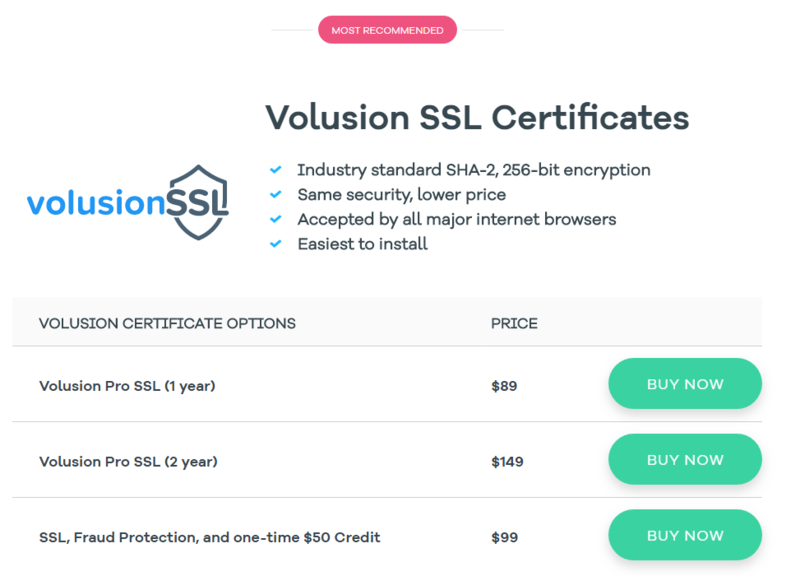 WARNING : Volusion charges $99 for SSL installation if you’re going to buy and use your own third party SSL. Merchants can’t install the SSL on their own. 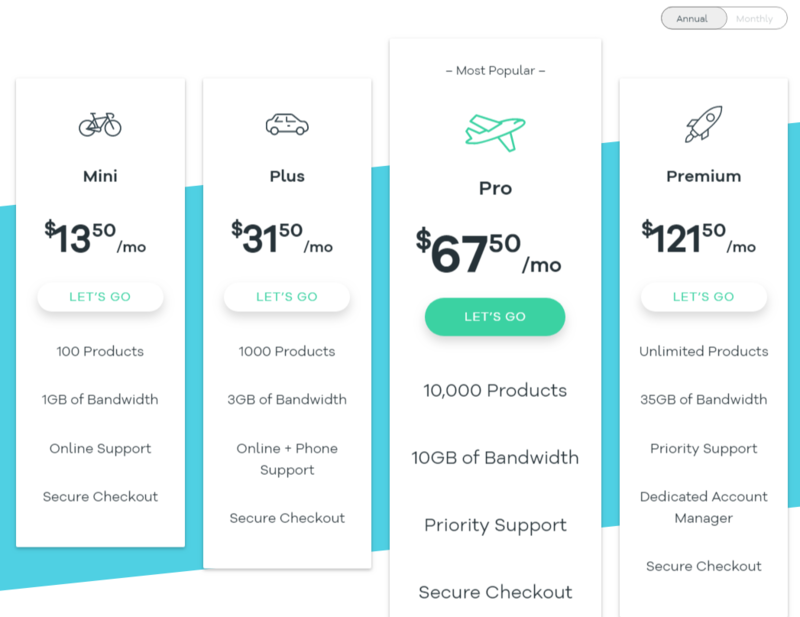 Tips for improvement : It would be good if Volusion can inform new merchants of this when they are signing up as some may have AND want to use their own SSL without getting a SHOCK that it will cost them $99 just to install it on their site. All plans do not come with email accounts. If you want Volusion to set up email accounts for you, you’ll have to pay them to set up the mailbox for you. Prices start at $2 for 1 mailbox and goes all the way to $200 for 100 mailboxes. The dashboard is nice and clean with the basic quick steps located prominently to guide merchants to complete their store and get it live. 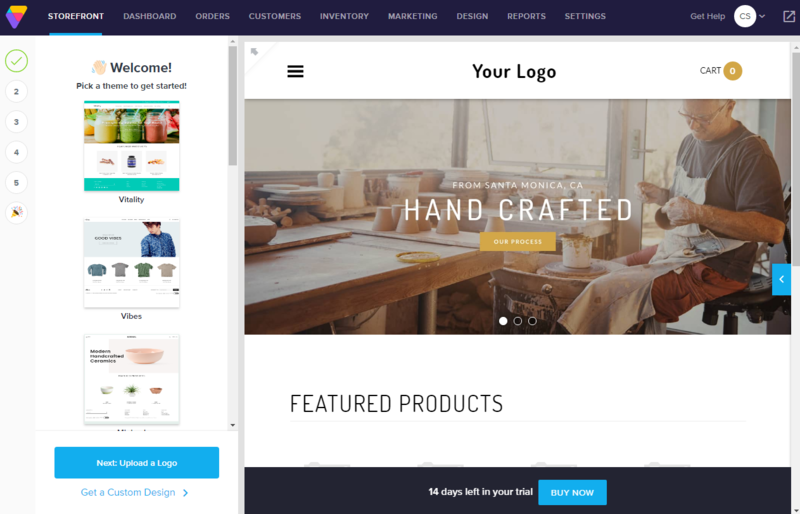 New merchants will automatically know how to pick a template, upload their logo and add products. Nice! For new sellers who do not have a logo yet and do not want to use text, Volusion has partnered with LogoJoy to enable merchants to create their own logo. Good initiative as it keeps sellers focused on what they need to build their online store. Making one’s site look beautiful requires good images. 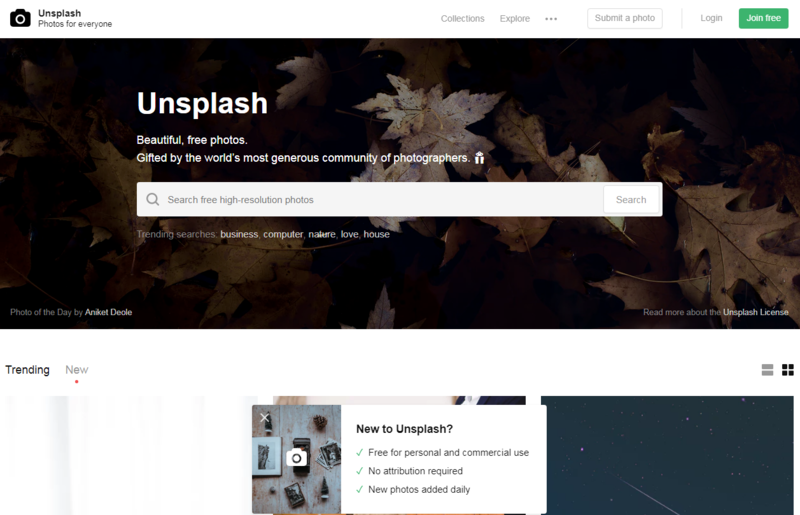 When it comes to customizing the look of your site, Volusion links to UnSplash allowing sellers to look for beautiful free photos to add to their site. Another good initiative. The dashboard displays graphs that displays sample data until merchants make their first sale. What’s good about it is the use of graphs to deliver information which makes it very easy to digest. There are also lots of tutorial videos on how to build, manage and expand your store to help with store setup. 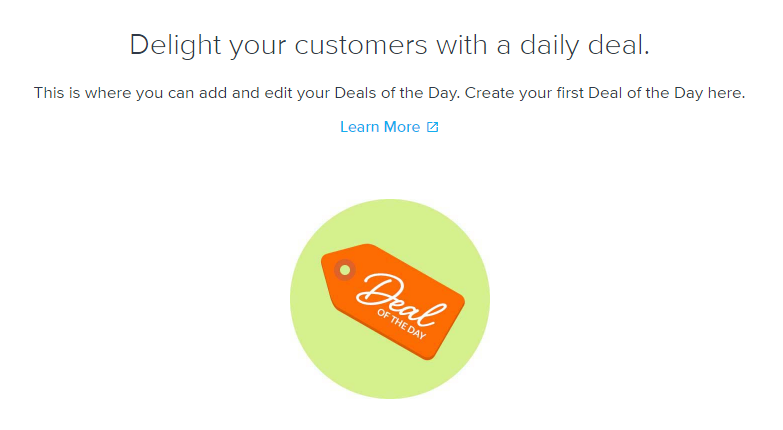 Hot Feature 1: Deal Of the Day. This feature allows you to easily create a dedicated page for your best discounts. Hot Feature 2: Volusion has something called Fraud Score which identifies behavior associated with fraudulent orders before processing them. The feature isn’t free but it may well be worth the cost. It’s currently on bundle offer with their SSL at $99. Setting up store is fairly simple and is a standard affair. The layout and colors used makes the interface easy on the eyes. Volusion has done a good job at removing all the clunk from the process of setting up a store so newbies would not find it overwhelming. 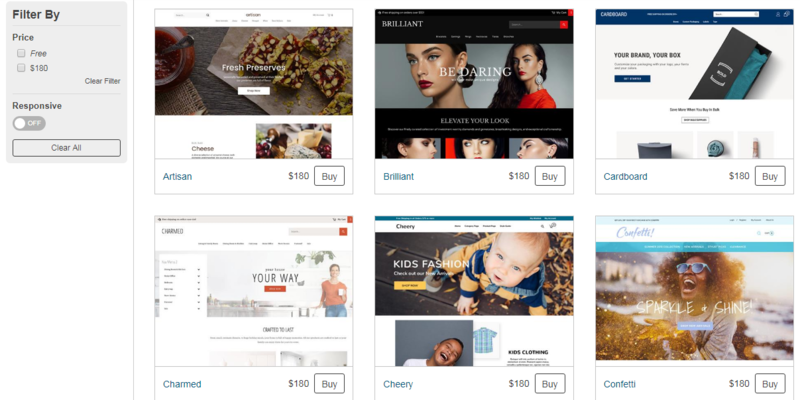 There are loads of ecommerce templates to choose from and you can narrow them down by price, colors, category and industry. Some are free but the really nice ones can set you back as much as $180. To me this is a fair price as template designs can cost a few grand. Of course if none of their templates caught your attention and you have plenty of moolah to splash around, you can always check out their design package which is divided into 2 sections – Premium Theme Design and Custom Store Design. 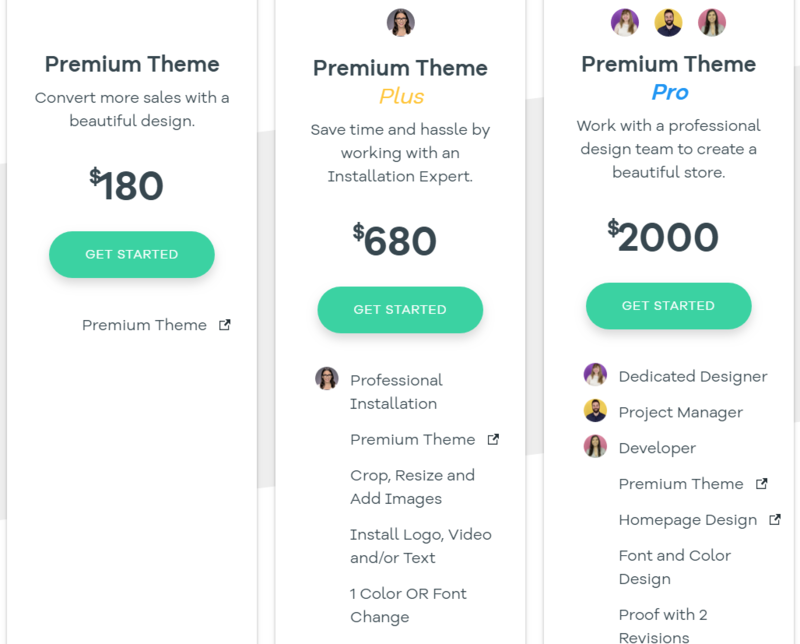 Buy a premium theme for $180 or work with Volusion’s design team to create one that is suited to your business branding. Don’t have the time and prefer not to deal with technical and design stuff? Volusion offers not only a custom design theme that is responsive with good UI (User Interface) but it also comes with Technical SEO (where their in-house SEO experts will optimize your website for technical performance) and Conversion Consulting (where they help re-enforce your brand while preserving valuable search traffic for your site). For the most part, support is pretty adequate. If the support you need is not urgent, the ticket system should suffice. However, there have been complaints about Volusion support tickets going unanswered for days. There’s even a YouTube video from a disgruntled longtime Volusion merchant who suggests the company calls its support LOS – Lack Of Support. That said, he didn’t sound too angry and I think he did it to get Volusion’s attention as his Customer ID and Ticket IDs could be seen clearly. Generally speaking, it’s mostly positive talk about Volusion ecommerce on social networks and forums. They get the same complaints as other ecommerce solutions providers do, which does not make it okay, mind you. They were also mentioned on a couple of ‘consumer complaint’ sites, again, just like a couple of their competitors. However, a quick background check revealed the sneaky modus operandi of such sites which target bigger companies and charge a fee to get a company of their list. Some of the ‘comments’ on these sites seem to have been posted by fake people. Update: Volusion seemed to have edited their Facebook and Twitter accounts. So you’ll only see good things there now. No more complaints about server downtime, bad customer support and other Volusion problems. I’m hoping it’s not because complaints about Volusion have been over flowing, what with the PCI security fee being passed on to merchants and the recent price increase in their subscription plans. Well, so much for being open and transparent. Fortunately, you can read more comments about Volusion here. Volusion has done a very good job with it’s software. But as with all ecommerce software, it’s best you take it for a spin before you sign up for a plan and see if it suits you. Volusion offers a 14-day free trial. For people with day jobs, that might not be sufficient. You could try asking for an extension if you need it. I did the same with a competitor of theirs and they happily obliged; gave me 10 extra days, they did. Volusion is a popular ecommerce software service provider. The company was founded by Kevin Sproles in 1999 and has offices in Austin and London. Among the famous names that utilize the companies ecommerce solution are National Geographic, 3M and Nalgene. Thumbs Up! Volusion powers over 450 non-profit stores as part of it’s Giving Back initiative. View a 2 minute Volusion vs Shopify review video here.